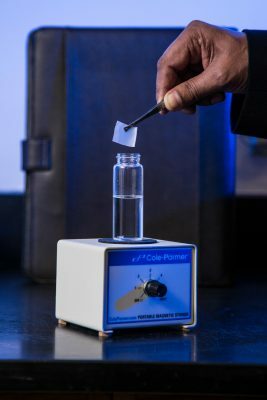 Research coming out of FIU combines advanced chemical coatings created in a campus lab with one of the most commonly available fabrics on earth. The work has led to patents with the potential to revolutionize the multibillion-dollar sample preparation and analytical testing industry. 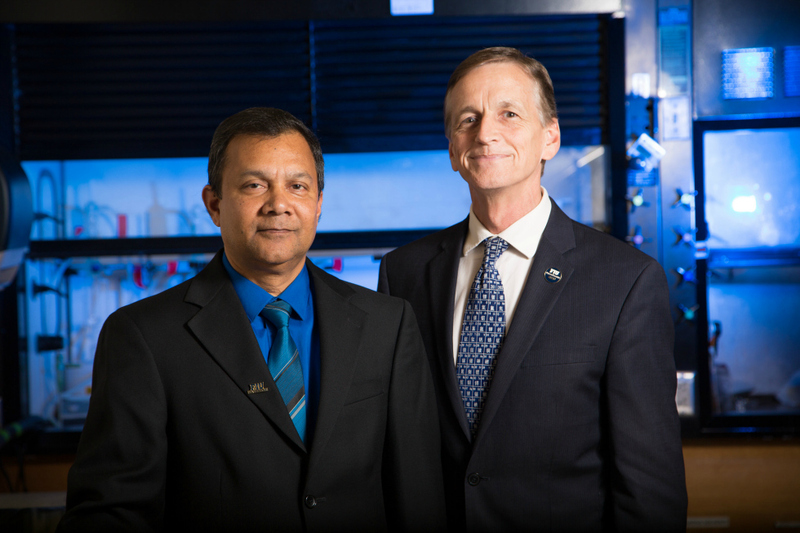 FIU Provost and Executive Vice President Kenneth G. Furton (pictured above, right) and Abuzar Kabir of the College of Arts, Sciences & Education (above, left) led the discovery. Furton, an analytical chemist and a fellow of the National Academy of Inventors who has five patents to his name and another six pending, and Kabir, a materials expert, collaborated on a way to simplify and enhance the chemical testing conducted by technicians in medical labs and coroners’ offices, as well as by environmental scientists in the field. Specifically, they wanted to improve the sample preparation process. Currently, to test for an illicit drug in urine or a pollutant in waste water, for example, the component to be analyzed must be separated from the sample in a complicated, multi-operation process that involves solvents and expensive devices. Depending upon a sample’s physical and chemical properties, achieving the required level of component extraction can take 24 hours or longer, and that time does not include the actual chemical testing. Among the materials the two scientists considered as a base for their portfolio of new chemical coatings was the same cotton muslin used to make apparel. The team of researchers experimented by applying a different coating to several postage stamp-size swatches and putting them in direct contact with various liquid samples. They were shocked by the result: Within 15 minutes, each of the targeted components was extracted in a quantity suitable for analysis. The FIU extraction method absorbs a greater amount of a component than currently available methods, which reduces the chances of false negatives and thereby improves the conclusiveness of test results. It also requires the use of little or no solvents, many of which are toxic, making testing environmentally friendlier. Already, researchers at 30 universities worldwide have devoted extensive time and effort to validating the patented technology, and more than 20 related peer-reviewed journal articles have been accepted for publication.